19.5 is finally here! I am feeling extra nerves around this workout because I know how badly it is going to hurt!! With that said, I know my fueling has to be on point! This workout requires a lot of minutes to be worked at a high intensity- which means carbohydrate stores will be a hug factor. Also, this workout requires a lot of mental fight, which means immediate carbohydrates will be crucial. We don’t often think about the fuel our brains need, but trust me, your brain can make you quit a lot sooner than your body quits if it senses it isn’t fueled well. Today I am fueling with fried rice for lunch. I will also consume an apple and RX Bar prior to the workout, and possibly a Fig Bar right before depending on my energy. All of these are carbohydrates that I know my body likes and utilizes well. As the workout gets closer, my carbohydrate intake switches to quicker carbs (fruit) vs slower carbs (brown rice). 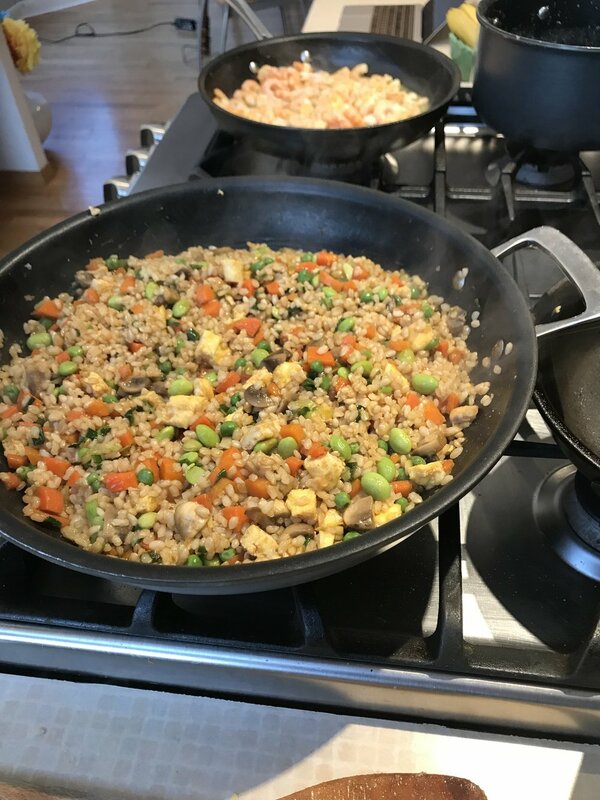 This fried rice recipe is a fun way to get some carbohydrates in! And good luck to everyone competing this week! Place rice in a saucepan with 3 cups water. Bring to a boil. Cover and reduce heat and cook until water is absorbed. Add 1 tsp Ghee/avocado oil to a saute pan at medium high heat. Add mushrooms and garlic and saute until browned (4-6 minutes). Turn heat to low. Add carrots, ginger, edamame, and scallions. Whisk eggs together. Heat another saute pan with 1/2 tsp Ghee/avocado oil. Cook eggs without scrambling (like an omelet). Once cooked, let cool and then cut into bite sized chunks. Mix in with rice and vegetables. Make sauce by combining soy sauce, Sriracha, sesame seeds and sesame oil. Add sauce to rice and mix. Heat shrimp and serve with rice.